CLICK "SHIFT REFRESH" or "SHIFT RELOAD" for the LATEST UPDATE. 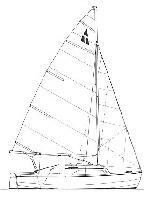 Greetings again and welcome to our second Hartley TS16 construction page! Here is the result of complete negligence and sheer vandalism on the part of the trucking company concerned. Our new hull was transferred from a covered transport during the journey to an uncovered position on top of a shipment of Fork Lift trucks, just behind the prime mover. 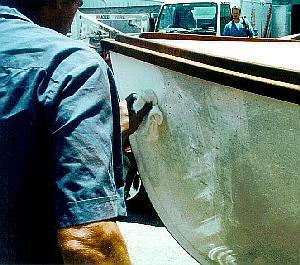 The trailer and partially finished boat ended up completely coated in hot diesel exhaust, inside and out. Those responsible for this act undoubtedly know that sometime in their lives they too will feel the pain caused to us just prior to Christmas 2002. 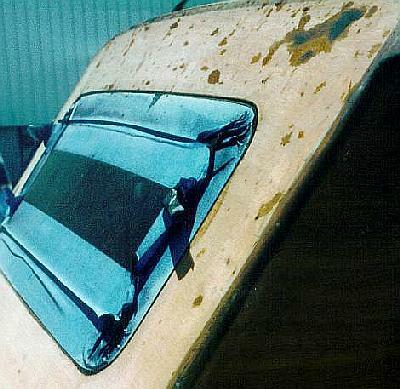 Although the upper surfaces were treated in Bote Cote and the gunwhales and sheer cap were boat oiled, the hot exhaust had significantly penetrated into the ply. 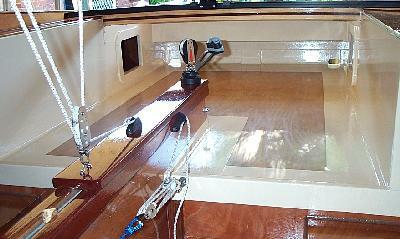 There was also damage to the bottom and topsides paintwork from obvious careless handling. With the skill and facilities provided by the dedicated staff at WA Fork Lift Trucks (whose shipment we shared for some reason), it was decided virtually on the spot to attempt degreasing of the bottom and topsides before the lethal mix penetrated the newly painted surfaces any further. 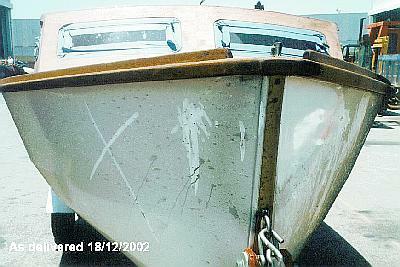 Even the Sikaflex under the brass keel strip had suffered. This action was partially successful, but there was more to come. We towed the new hull to its rightful place in our garage and then spent the next 6 months periodically treating all surfaces with methylated spirits (gallons of it!) as the oily residue continued to leach out. We set about doing a complete but preliminary fitting out, as it was obviously going to be some time before the timber could be finally varnished or painted. 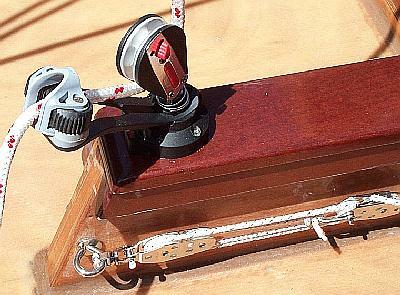 The swivelling mainsheet final ratchet block with cleat and centreplate blocks are here shown mounted on the centrecase. Aluminium rudder box now sprayed, tiller constructed from Jarrah door stop (a Western Australian hardwood), laminated rudder yet to be finished. The flag raising ceremony! The entire rig was hoisted and trialled for the last time prior to complete disassembly of all fittings for final varnishing and painting. Now we're making progress - a view from inside the cabin looking aft. The deck beam (top of picture) was laminated from Jarrah door stop and White Pine against the pre-curved aluminium track and installed at frame 5. We did away with the white hinged hatches aft and opted for simple openings as experience has shown the need for somewhere to throw things. Painting and varnishing is well under way although the anti-slip cockpit floor finish is yet to be done. The non-painted area is where the clear anti-slip will be. You can see the 5:1 block setup for Genoa luff tension against the centreplate case. 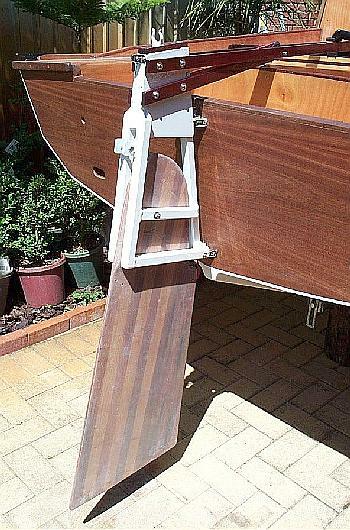 The other mechanism going vertically holds down the two split hatch covers and just unclips when they are not installed. There's some distance to go yet but at least we're moving forward again. 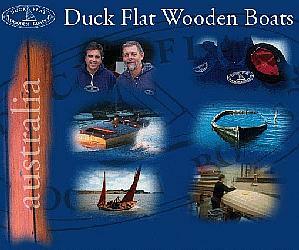 Duck Flat Wooden Boats for providing a beautifully constructed traditional wooden TS16 hull using state of the art techniques. International Paints and Bote Cote for amazing products. 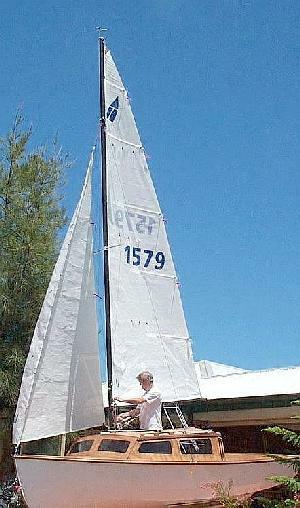 Halsey Lidgard sails Fremantle for a fine working suit. The Spar Shed for great work with the mast, boom and standing rigging. 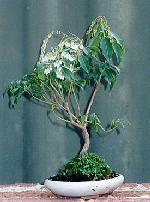 Ronstan (WA) for their support with this project. Yacht Grot in Fremantle (and Kirsty in particular) for superb consultancy in the selection of the best Ronstan fittings. The members of the WA Hartley TS16 Association who gave freely of their time to help an inquisitive enthusiast rejoining the class after a 40 year break! 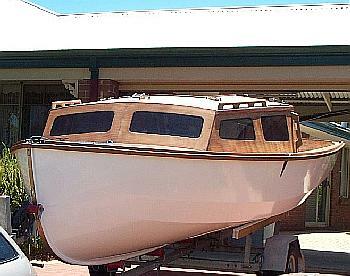 Club Marine Fremantle for their professionalism and understanding during the shipment insurance claim. Watch this space - more to come as we move toward the launch.